unf god i love V8's, and I really love that v8. and hell yes to 5 speed swaps. Radical dude. so much epic. There's the topic on it. Can't believe that was 7 years ago! Jump to page 4, unless you want to read some interesting commentary on life in your late 20's. The shafts had balance weights on each section, and that car never ever had a driveline vibration when I owned it (and I don't think Garrett had any issues either, after he bought it from me). pilihp2 wrote: unf god i love V8's, and I really love that v8. 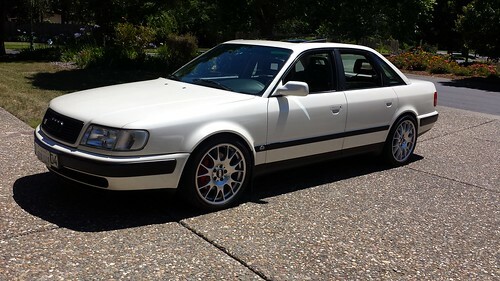 I'm so excited by this swap, I somehow justified financing it entirely on a car I don't technically own, but it's becoming mine more and more. I'm considering just making an offer to my dad to make it official. In any case, IT'S TIME! I went out one last time to do some epic 6000 RPM neutral-bomb launch vids, which turned out utterly disappointing. It seems Audi anticipated my shenanigans and has it cut power until RPM's drop to ~1500 before engaging a drive gear. Curse you and your failsafes! 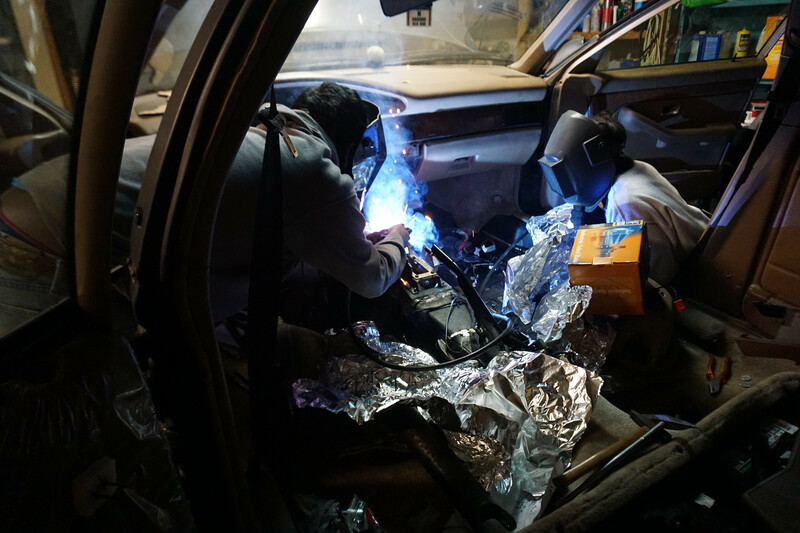 Anyways, I pulled the interior today in anticipation of welding in there, but that's as far as I got. More work to come this weekend! Here's where I stand on parts. I'm pulling parts from a donor 200 tomorrow, and hopefully should get everything in yellow! lol epic fail on the launch. That would have been awesome though. I know for a fact that lincoln MKVIIIs did not have that safety feature in the early 2000s lol. I didn't get as much done as I'd wanted (ruuuuuusssst), but I should have the old box out next weekend if I have time to work on it. Only thing is I canNOT get the driveshaft off. Bolts are off, everything's PB-Blasted, and I've pried and hammered to no avail. I have a few ideas, though that I'd like to try out - with varying degrees of sketchiness. 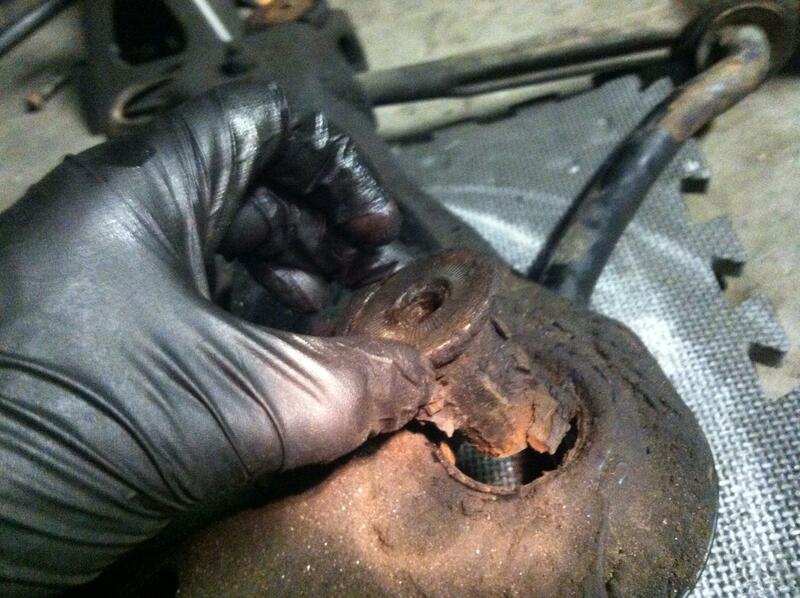 When I did the clutch on my S6 last summer, no amount of hammering would get the driveshaft off the transmission. So, I disconnected it at the rear diff, too, and I was able to break it free there. I then pulled the transmission with the driveshaft attached and hammered the crap out of it on the ground until the driveshaft popped free. 8 extra bolts (6 at rear diff flange, and two at driveshaft support bearing. Drop the center support bearing and apply downward pressure on the on the driveshaft while bashing on the CV? It might be time for Mr. Torch to help out, too. Good luck! Thanks for the tips man! I actually had my brother pry while I hammered, but it wouldn't budge. We stopped because the pry bar was starting to deform the body where it was levered at. I'll break out the torch if I have to, but only after I've exhausted all options. I'd hate to damage the CV boot or joint. When I get a chance, I'd like to try putting the trans in neutral and having a bunch of friends pull on strap wrenches around the driveshaft. Hopefully that'll be enough to break the bond with the diff. Then I can just do the other side! The sketchier variant of this would be car in the air, hit the brakes and put it in drive with the car running. Last resort, I can take a sawzall to it. I only need half the driveshaft for the swap. Got it! Doing so may or may not have involved physically mutilating the trans, but it's just a silly auto, so it's okay. I cut a little window in the trans cup and FINALLY I could hammer a flathead in the seam and split them up, at the expense of the screwdriver (RIP). Seeing how clean it was, I'd surmise this is the first time the driveshaft has been off since Germany. Of course, this wasn't the only hangup in tearing the old box out of there, but it was the first step in realizing why the hell am I being delicate with this thing? From then on, I simply tossed any obsolete parts into a big garbage bag, and not-so eloquently mutilated anything I didn't need anymore. Gear selector won't pop off? Snip snip snip. Cooler lines in the way? I'll just bend that a bit. Finally, at around 5 a.m. ( ) and we got that beast out of there!! Big thanks to the fine folks of DriveUT who came to help out and make light of my frustrations. Couldn't have done it alone (seriously, that trans is MASSIVE). I wanted to do the rear main seal, too, but it looks like it's $350 so I'm just gonna cross my fingers and hope that it never ever leaks. So that leads me to this thought: there's an OEM V8 flywheel for sale now for a good bit cheaper than the Fidanza was. I'm thinking of picking that up and selling the Fidanza to offset some of the cost of the swap. Any thoughts? I've never driven an aluminum flywheel, but I have to wonder whether the price difference is really worth the weight savings, particularly when this is certainly no racecar. Wow! Nice work. Good idea to cut through all the junk. For the flywheel - I have drove both types on a 16vgti (~50% of your motor haha) - the lightweight one is nice and feels different in it's eagerness once engaged - The oem one made it much smoother and easy to drive in stop and go. If you are going to sit in a McDonalds or Wendy's parking lot revving your motor then definitely it's a must have! Seriously though - I think it could be fun on a v8 to lighten things up - I would personally go with the oem one for cost and durability but if you already have the fancy one just use it. Swapping around parts will just be a hassle haha! I would do that seal regardless of price - but I have no idea why it's so expensive? rockauto.com has nothing? 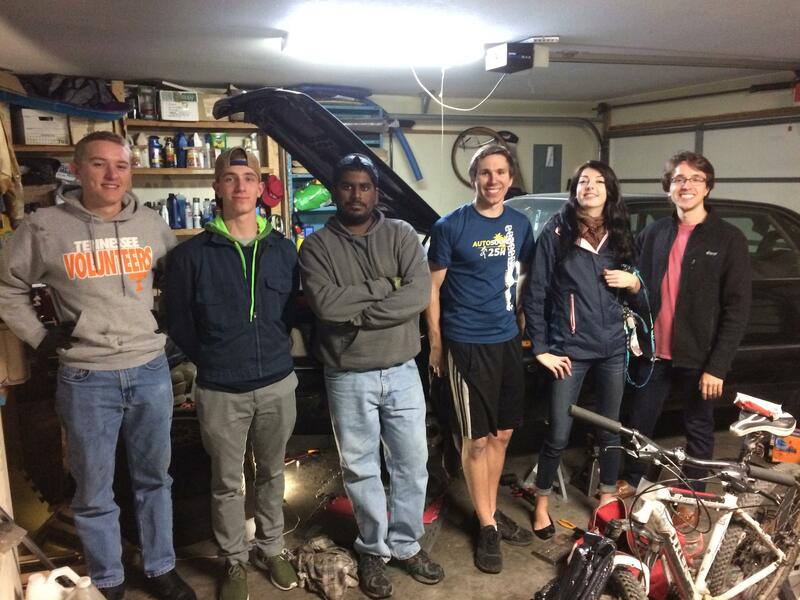 Funny how big of a crew you have - your garage is really clean. If your friends aren't around and you have space a transmission jack is a cool piece to have: http://www.harborfreight.com/automotive ... jacks.html - better yet a floor jack with a huge square of wood does the same to get it back in. Hope to see it go in quick I would be in the camp of getting it moving and working with the manual swap before the other items. All of the others seem like something you could do over a weekend(s) while still enjoying it. ¯\_(ツ)_/¯ I will be watching either way! Why is no one dirty? 90quattrocoupe wrote: Why is no one dirty? Haha, this was when my dad was still awake to take the shot, so we were only 30 minutes into it. By the time we finished up, I think we were all too delirious to assemble for any sort of photo. themagellan wrote: Wow! Nice work. Good idea to cut through all the junk. Thanks Mage! I actually borrowed my friend's wide-based motorcycle jack for the task. I've dropped the manual trans with just my floor jack and some hands steadying it, but this auto is freaking HUGE! We stuck the big jack up front and my floor jack on the tail end and use the combo to tilt and drop the trans out of there. It took three of us just to get it out of the garage! Given your impressions, I might be inclined to agree about the flywheel. It's pretty light at around 9lbs, but the good news is that it'll be coupled to a stock 200 clutch, so it shouldn't be too undriveable or annoying (I hope). I think OEM is just over 18lbs. Yeah, unfortunately, the seal is an integrated rubber seal and a metal plate. I can't even find a PN# for the rubber ring in the middle. I don't know where I saw the $350 figure, because most numbers I'm seeing are actually $400+... I just can't find a way to justify that for a part that still works. You are right, though. A lot of that can be done after the fact. I'll take a closer look at what really needs done while I work on it, but I'll just focus on the swap for the time being. Thanks, dude! Last edited by Aktapod on Thu Dec 22, 2016 11:49 am, edited 1 time in total. Progress is slow, but it's progress! I will update soon with more details and pictures of the process. I'd like to spray the welds with primer and route the clutch hydraulics tonight, but otherwise it is very close to the point of reassembly! Hard stuff is out of the way now! I'm glad to finally be done with all those things. The past couple of weeks have been a little hectic working most of the time and getting in some progress whenever possible before passing out. I'm out of town for now, but hopefully it should be up and running shortly after the New Year! I love to watch people go all in like this. I'm excited to see this at Carlisle in the spring! 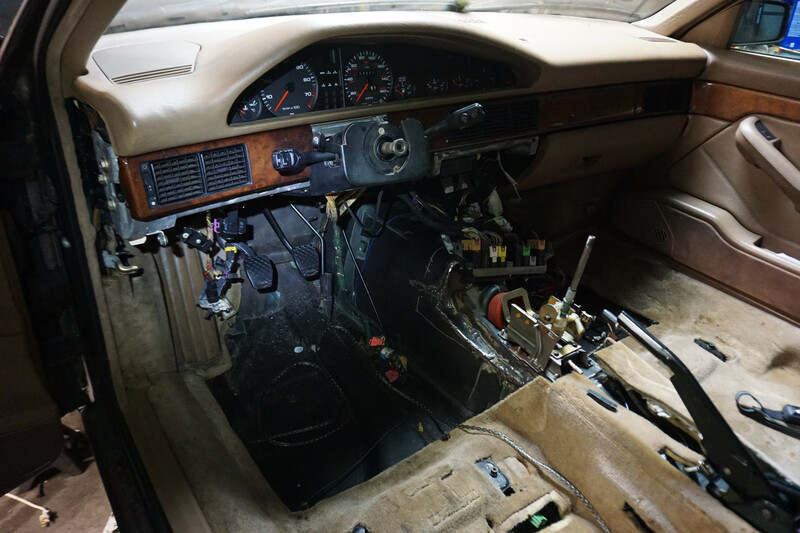 woo v8q 5-speed conversions! I miss my converted car, that was fun. Definitely have Jorgens do the rack, flush it with redline psf and install a magnefine filter. 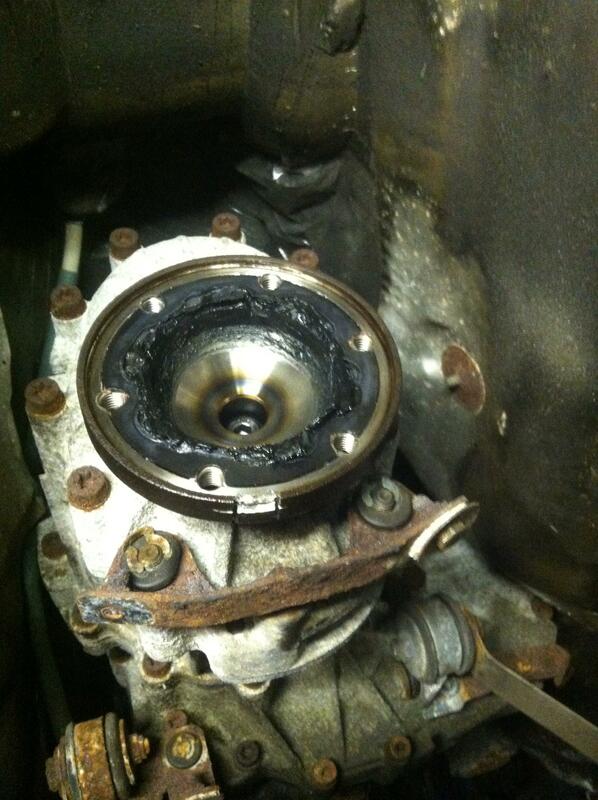 Try and find the rear main seal by itself without the flange. It was the same situation with my aan but somewhere in the QW archives the seal only part number was listed, it saved me some money. Good info, Dan! I actually posted up on QW and got a PN for the just the rubber seal (068 198 171), which seems to be dimensionally identical to the 5 cylinders. Is there any special tool or procedure for it? I remember the front was a huge pain without the special tools. As for the rack, I think I've decided to not do it. I hate leaving it, but the leak is so minor, and doing so would require more downtime once I get back from Wisconsin. If by some miracle Jorgens has a core on hand when I call, I'll order it and get it over with. dspl1236 wrote: woo v8q 5-speed conversions! I miss my converted car, that was fun. I just used a big block of wood and smacked it right in there, with the flange removed of course. You may want two if it doesn't work out right. I always try and have spare seals just for that reason. Jorgens is 2 or 3 day turn around, that's not a good enough excuse not to do it! Get the powerflex rack to steering rod bushes as well if you have time and money.